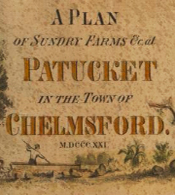 On the sandy shore, opposite the Glass-house village in Chelmsford, at the Great Bend where we landed to rest and gather a few wild plums, we discovered the Campanula rotundifolia, a new flower to us, the harebell of the poets, which is common to both hemispheres, growing close to the water. 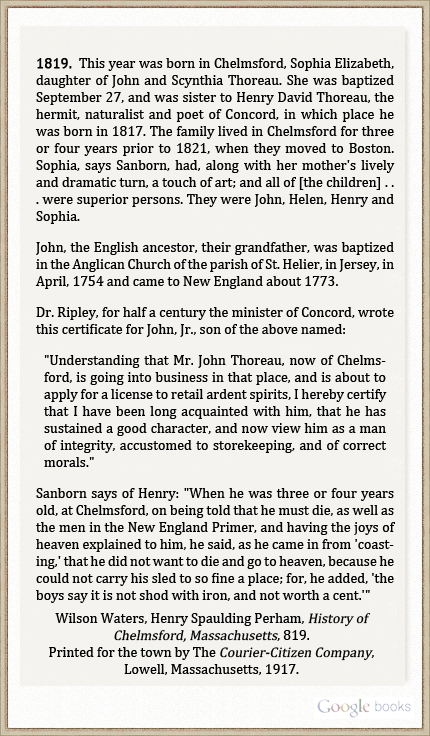 Soon after Thoreau was born in Concord in 1817, his father, John Thoreau, moved the family to Chelmsford to open a grocery shop. 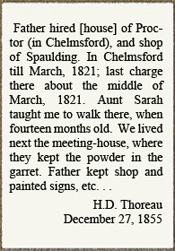 John Thoreau earned some income by painting signs while his wife, Cynthia Thoreau, minded the store. In 1821, when his dry goods and "ardent sprits" shop failed to prosper, he relocated the family to Boston to try his hand as a school teacher. 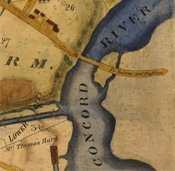 Thoreau's A Week on the Concord and Merrimack Rivers, drafted during his stay at Walden Pond, contains many references to Chelmsford including comments on the transformation of the town as the nearby city of Lowell rapidly expanded its industries. 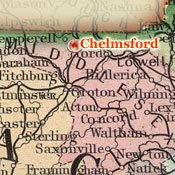 Map of Farms in Chelmsford. Click to enlarge and view source. Click to read complete entry.